​What are the adrenal glands? The adrenals are two glands which are attached to the top of the kidneys and they are made up of two parts - the adrenal cortex which is the outer part and the adrenal medulla which is the inner region. 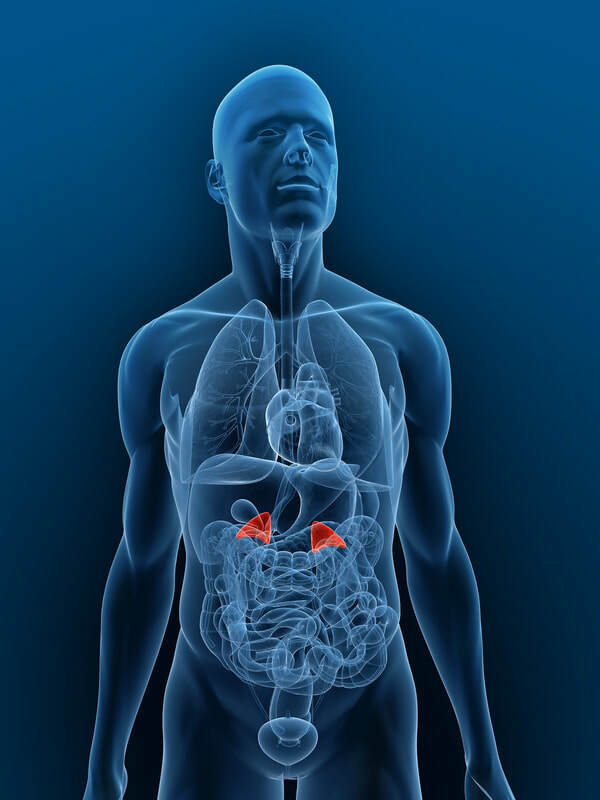 The adrenal glands are triangular shaped and they measure 1.5 inches in height and 3 inches in length. What role do the adrenal glands play in the body? In times of stress, the adrenal glands assist the body to be able to cope with the stressful situation so that it can perform to its best ability. When stress occurs the brain recognises the stressor and switches on its autonomic nervous system and neurobiological processes so that the individual can respond accordingly, the adrenals then release cortisol, epinephrine and norepinephrine. The body is sent into hyper-alertness with adrenaline which increases heart rate, blood glucose, blood pressure and breathing rate. This process is known as the ‘flight or fight’ response which is essential and normal in times of stress. ​Early humans needed this ‘flight or fight’ response to evade deadly predators and go on dangerous hunts for food, modern day humans experience this response on a daily basis because we lead more far fast-paced and complex lives. Not only do we have to think about food, shelter and water but we need to consciously think about money, work pressures, relationships, bills, tight time schedules, providing for our children and general stressors. Below is an animation video of how the body reacts in times of stress. The video gives you an idea of what role the adrenals play in this important physiological and biochemical response. This response can take place daily for a lot of people because of the type of lifestyle modern day humans undergo. If the ‘fight or flight’ response is repeated on a frequent basis, the adrenals become fatigued impairing their function causing a wide range of mental and physical health symptoms. Stress has occurred so much that the adrenals lose the ability to recover and rest. Mainstream medicine does not usually recognise adrenal fatigue as a medical health problem; there are however diseases and disorders involving the adrenals which are acknowledged such as Cushing's syndrome/disease, Addison's disease and adrenal gland tumors. Adrenal fatigue is usually a gradual process in which repetitive stress gradually puts more and more strain on the adrenals and not allowing them to recover properly; this is the most common adrenal stress pattern. Another adrenal stress pattern is a single major stressful event; these are things like a life threatening situation or physical crisis such as surgery which burn the adrenal glands out but lose the ability to recover because of further stress and strain. Adrenal fatigue is a big problem; there are a lot of people who are experiencing this issue or who will experience this problem at least once in their lives, many people do not realise that they have some degree of adrenal fatigue. What are the causes and influences of adrenal fatigue? Humans are only capable of taking so much stress, eventually the body will reach a peak where the system is unable to cope. Repetitive stress and repetitive strain of the adrenals glands is like using money constantly out of your savings, eventually you will be in debt affecting how you survive and thrive. Adrenal fatigue can really affect people's lives causing them to lose their jobs, lose relationships and do things out of character. People are more prone to adrenal fatigue if they work in stressful and high pressured environments which involve meeting important deadlines, tasks with high amounts of responsibility, fast paced work and working within tight time schedules to produce results. ​All jobs have some degree of stress involved, but there are certain industries where individuals are more susceptible to adrenal stress patterns and 'flight or fight' releases, adrenal fatigue can also be influenced by other reasons outside of the workplace. What are the associated mental & physical health conditions/symptoms associated with adrenal fatigue? When the adrenals are becoming more fatigued through stress, there are distinct symptoms that start to happen such as anxiety, insomnia, irritability and stress intolerance. People with fatigued adrenals will not be able to cope with stress as well as they once could. The adrenal glands can enter an exhaustion phase if there has been so much stress on the body that the adrenals can no longer stay in the resistance phase and have the opportunity to recover. In this phase an individual can become weak and the symptoms of adrenal insufficiency are more prominent. It is likely that an individual can be sick off work for a number of days and struggle to carry out daily activities and be housebound. People can enter the exhaustion phase several times in their lives then recover into a less fatigued state but then enter an exhausted phase again once there is a great amount of stress on the body, it can become a vicious cycle. There is a strong association between adrenal fatigue and heavy metals such as copper. The copper build-up problem is linked with the adrenal glands because they are needed to work with the liver to produce ceruloplasmin and metallothionein which are important copper-binding proteins (for more information on copper toxicity please click here). If low amounts of these proteins are produced then it will result in excessive and unbound copper contributing to copper toxicity. Cortisol is a life-sustaining adrenal hormone which is known as the stress hormone. Cortisol influences and regulates/modulates many of the changes that happen when the body is responding to stress. The balance of cortisol in our system is important for our overall health. Cortisol levels are high in the morning and this is known as the cortisol awakening response, as the day progresses the body's cortisol levels gradually decline in a normal fashion and end up being at their lowest in the late evening. With adrenal fatigue, the cortisol cycle is disrupted and levels can be low throughout the day especially early morning and can peak in the late evening keeping someone stimulated and awake at night time. Adrenal stress initially creates high levels of circulating cortisol and a greater need for cortisol production, but this can then result in a drain in cortisol levels, if the adrenals are weak then they cannot produce necessary cortisol for the body. Imbalanced cortisol levels/cycles can have a big effect on mental and physical health, cortisol levels/cycles can be brought back into balance if the adrenal glands are healed and restored. A hair mineral test will be able to detect certain mineral levels and ratio readings that give an indication of reduced adrenal activity and function. The more extreme the markers and readings the more advanced the level of insufficiency. The hair mineral test is a reliable way of testing for adrenal fatigue because the test is measuring mineral levels contained in hair which indicates the storage levels in body tissue because hair works as a soft tissue biopsy. The hair mineral test can also detect 5 different toxic metals which exist in the environment and certain food and drink sources. Toxic metal accumulation is the majority of the time associated with adrenal insufficiency. For more information on adrenal function testing please click here for the available tests page.